We are currently restructuring some of our program offerings, and as a result, will not be offering DEEP Leadership Camp for the Summer 2019 season. Please join our mailing list to keep up-to-date on upcoming Outreach programs and events. DEEP’s engineering leadership overnight camp takes place at the Gull Lake civil survey camp in Ontario’s beautiful Haliburton forest. The camp, which runs concurrently with DEEP’s academic program, offers a focused approach to developing students as leaders and future engineers. DEEP Leadership Camp offers high school students the opportunity to explore personal leadership development through a unique integrated curriculum that includes practical applications drawn from STEM (science, technology, engineering and math) fields in an outdoor setting. Participants will explore topics in science and engineering through fun, interdisciplinary activities. What is engineering? What do engineers do? Participants will also have time to relax and enjoy the sun, swim in the lake, canoe, play sports and hike the surrounding wilderness. Please note that students attending this program will engage in a rigorous, leadership-focused camp experience covering a range of topics and activities over the course of the program. An outline of proposed topics will be provided to participants ahead of the program’s start date. 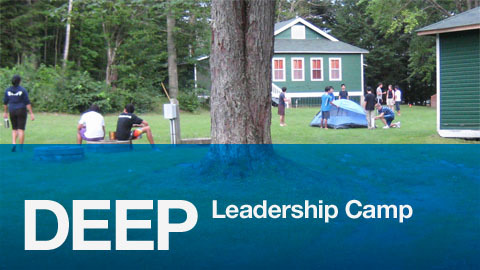 The tuition fee for DEEP Leadership Camp includes all course costs, including transportation by bus from the St. George campus of the University of Toronto to the Gull Lake civil survey camp, and bus transportation to return to campus at the end of the program, as well as all meals, activity materials and equipment, and accommodations in camp bunkhouse cabins. 2019 tuition fees will be announced shortly.